Traditional wilderness huts inspired this bar and kitchen in Adelaide, designed by local office Sans Arc Studio to slot into a narrow alleyway. Squeezed into a four-metre-wide opening between two much taller buildings on Leigh Street, Pink Moon Saloon comprises a pair of small huts with steeply pitched roofs and a small courtyard in between. Sans Arc Studio wanted the space to evoke the sense of adventure associated with pitching a tent and eating around a campfire. "The experience of this bar was to be entwined with a narrative. This narrative was of the outdoors – a childhood memory of fire-cooked food and camping in the forest," explained the designers. "Throughout the design process the concept evolved and settled on exploring the typology of the wilderness hut." Pivotal to this concept was the choice of materials. The team opted to use a mix of locally sourced woods, including spotted gum, Tasmanian oak and ironbark. The two huts also have timber frames, which are left exposed and painted in vibrant shade of blue. According to the team, the colour scheme was loosely based on Himalayan mountain cabins. Blue tones are similarly applied to the window and door frames, and to the leather seating upholstery. "The intention with Pink Moon was to create its own identity or vernacular; by designing and building in the way a hut should be," stated the designers. "The hut needs to embrace its surroundings, not dominate them, but embellish and appreciate them," they said, "creating a moment of warmth and shelter within whatever context." The narrow site – 28 metres long, but just 3.66 metres wide – provided the biggest challenge. It was this that led to the venue being split into two buildings, maximising opportunities to bring in natural light. The front hut containing the bar is the brightest of the two buildings, thanks to large areas of glazing. 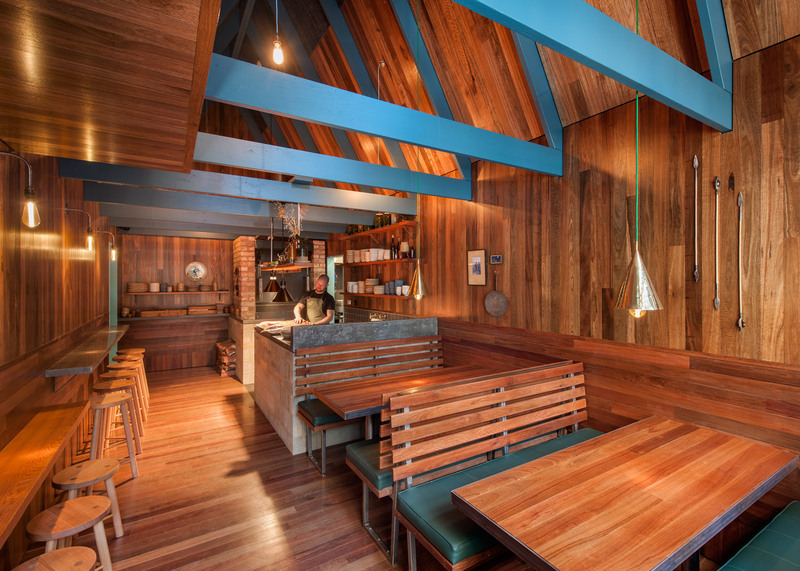 The restaurant occupies the hut at the rear, and is a more dimly lit space "focused around a fire". "This layered approach allows light to filter into both spaces, but also accentuates the movement of walking through the space, crossing multiple thresholds and experiencing three different spaces," added the team. The small courtyard has very little lighting of its own, and is instead illuminated by the two buildings. It offers a couple of seating areas, framed by a large planting box. Other notable details include walls of bessa blocks – Adelaide's traditional masonry – plus golden metal lighting fixtures, a polished concrete bar, and a green signage board. Pink Moon Saloon is one of a number of new bars to open in Adelaide since South Australia passed the Small Venue License – a new piece of legislation intended to support small businesses such as bars, restaurants, galleries and live music venues. Other recent additions to the city include a burger bar with white tiled walls and neon signage and a new branch of skincare store Aesop.